A most unlikely combination indeed. Something that I have never seen before. But yeap, there are rambutans and durians in the market. I put some on the Christmas tree in my house and they do look pretty as ornaments, don’t they? 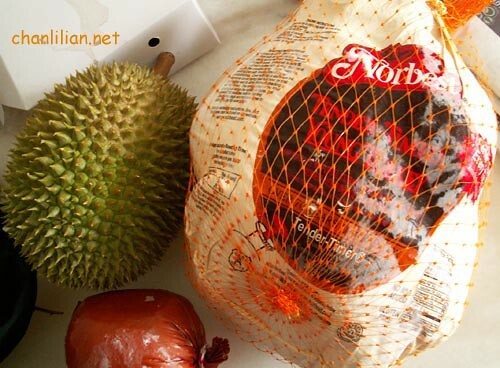 Durians! In December too. Not sure which state of Malaysia these durians come from. (forget to ask the seller) But they do taste ‘not bad’ considering this is not the season for durians, not until the month of May-July. I am all ready for Christmas. Bought the above turkey from Tesco, costing RM54 at 4.5kg. The turkey is from Norbest, USA and has a built in timer that will tells me when the turkey is done. Cool gadget, eh? It is going to be my first adventure in roasting a turkey. Glad that I found a wise auntie from my church who will provide me the recipe (yet to get at time of writing). She had spent a few minutes telling me what to cook for the vege, potatoes, soup and stock. Yummm…. 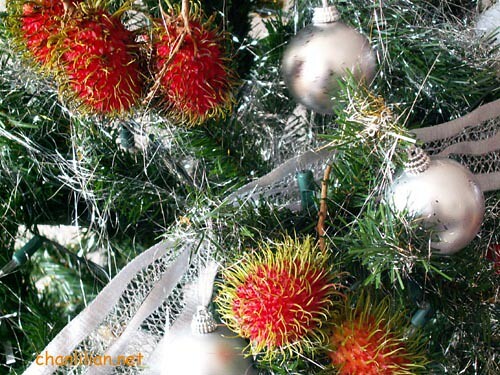 That will be our tropical Christmas of durians, rambutans and turkey. lilian i sooo want to go have christmas dinner at your house! HaHaHa LOL/KKK. That rambutan is classic. Sesuai untuk negara beriklim khatulistiwa. Sambil lalu kat situ boleh petik sebiji. Lagi best kalau ada manggis, langsat, dokong, salak, sentul, mata kucing, mangga. Durian tak boleh, takut pokok tu tumbang. Berat sangat. My parent pula buat turkey curry for Raya.